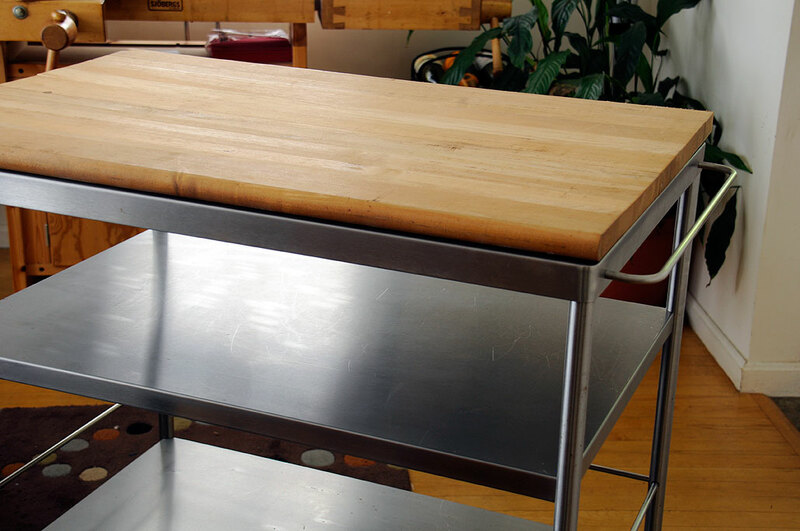 When we “acquired” the IKEA FLYTTA stainless steel kitchen cart in June, we came up with a really nice accessory for it: a cutting board. IKEA does not sell a cutting board that large, so we looked around for an alternative. We soon discovered that a commercially made 36″x24″ maple butcher-block cutting board can set one back anywhere from $200 to $500! That was when we remembered we had a table top from an old DIY project which would be perfect for the cart. OK, perfect once we cut it down to size, sanded off the grime, and refinished it for food use. The large piece of maple was a table top we made (out of maple stair treads) over twenty years ago. It had been in storage for the past ten years, forgotten, until last week. We found it leaning up against a wall behind the “too good to toss” stuff and the “we may need that someday” things. The board was not in to too bad a shape (no warpage, splits, or deep stains). With a bit of work, it should do nicely. The piece was too large to cut on the table or the radial-arm saw, so we attached a guide and cut it using a circular saw. The blade on the circular saw is a carbide-tipped one . We like it for cutting hardwood such as maple because it cuts fast and leaves a relatively smooth finish, which reduces the amount of finishing work required. The surface of the board has a layer of finish on it and we need to remove it before we refinishing it for food use. Whenever we have a sanding project we know will throw off a lot of dust, we like to take it outside. The Rockwell JawHorse has been an extremely handy piece of gear for this purpose. It is very portable, sets up quickly, and will hold just about anything firmly and securely. There are other portable clamping work-tables on the market (WorkMate , PortaMate, FesTool ), but none of them are as versatile as the JawHorse. For example, to get the JawHorse clamps to hold this piece, all we had to do was flip the rail around and we were ready to get to work. 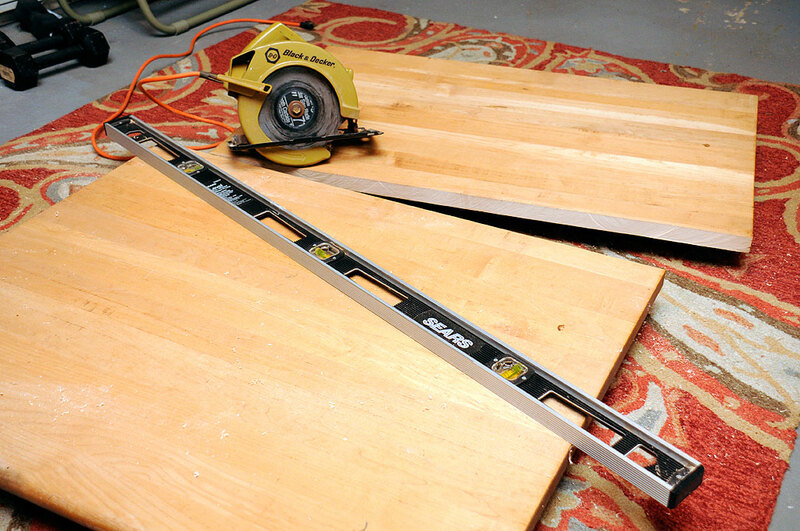 The sander and a few 100-grit belts made quick work of removing the top layer of finish and accumlated grime. This DIY is not finished. There are a few more things we need to do to it before it is ready for kitchen duty. It needs a few more passes on the top with increasingly finer grit sandpaper. We are also considering whether to cut it a bit smaller so it may be placed on the lower shelf as well as on top. To do those things, we need someone with a better-equipped workshop. We know a guy, but it will be a few days before we can bring the board over to his shop. Stay tuned.